The American Legion Dunbar Post 1642 appears to have been originally built as a private residence, but by the 1929 served as the odd Fellows hall for the Independent Order of Odd Fellows, an altruistic fraternal order (The Rebekahs were the female auxiliary groups) that, at the beginning of the 20th century, is reported to have had 26,000 members in Central New York. Odd Fellows Hall was used for a variety of events including meetings, socials, weddings and more. 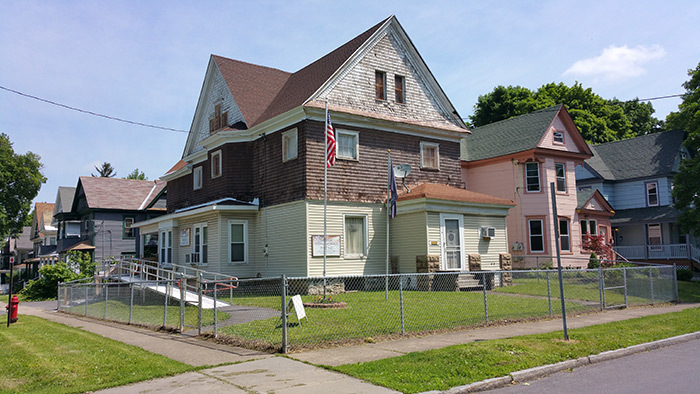 By 1971, the American Legion Dunbar Post 1642, which had been founded in 1946 by John H. Williams and Herbert A. Johnson and had been meeting at 204 South Crouse Avenue, occupied the building and had presumably purchased the structure for its headquarters and meeting hall; a role that continues today. The Dunbar post is a primarily African-American legion hall named after Paul Lawrence Dunbar (1872-1906), famous Black poet, novelist, and playwright of the late 19th and early 20th centuries. 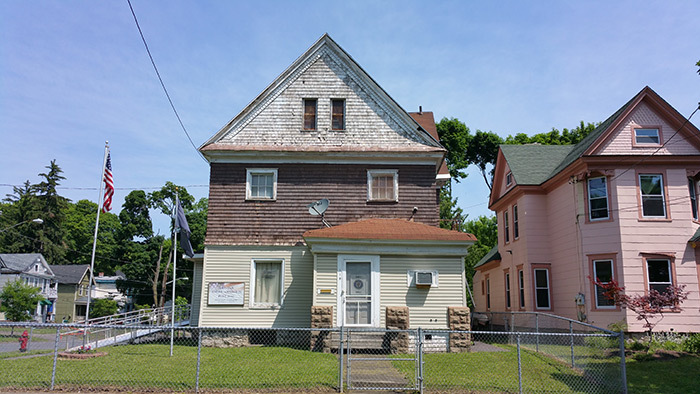 The Legion post probably had its origins through Syracuse’s venerable Dunbar Association and Dunbar Center, founded in 1918, and incorporated in 1935, as the primary African-American recreational, social, and cultural center in the city of Syracuse. The Dunbar Center was the core of the 1930s black community and served many functions throughout its history. Note the unusual metal (iron?) roof. It is not know when this was added.